Kindergarten-Grade 3. 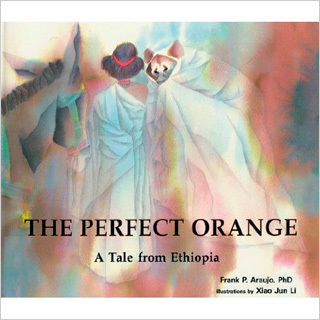 In this gentle story from Ethiopia, an orphan girl presents the Nigus (king) with a perfect orange and refuses payment. She does accept a donkey, however, unaware that its saddlebags are full of gold and precious jewels. Ato Jib, the Lord Hyena, mocks the child’s simple gift, but when he sees the richness of her reward, he hurries to the Nigus to present all his lands and cattle and receives the perfect orange in return. Araujo’s straightforward style is well suited to the simplicity of the story. Although the occasional inserted pronunciations can be distracting, they are certainly useful, as is the glossary. Li’s delicate watercolors mesh well with the text. The earth-toned illustrations sweep across the pages, and are touched with brighter colors and intricate details. The human characters are a little stiff, but the hyena, muffled in his white robe, sparkles with mischief. An author’s note identifies the oral source of the tale. A pleasant offering by the author and illustrator of Nekane, the Lamina, and the Bear (Rayve, 1993).